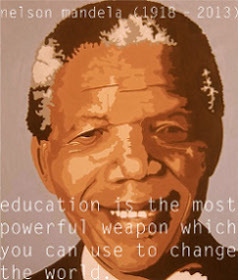 The secondary educators work closely with the students to address issues related to addiction and safe media use. 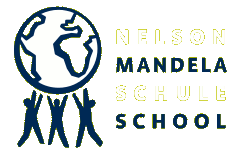 The educators are in regular contact with the school management, parent committees, local support organisations and the Berlin Police. If problems are identified, support and information about where to get help are offered to the students and parents concerned. If you have any individual questions or concerns, please request an appointment with one of the secondary educators. You can reach them by phone or e-mail. Here is an overview of the topics covered by the prevention program for the 2017/2018 school year. Nachdem die Schüler*innen des Leistungskurses Kunst des 12. Jahrgangs am 13.12.2017 im Bauhaus-Archiv, ihrem „extended art campus“, die aktuelle Ausstellung NEW BAUHAUS CHICAGO kennen gelernt und ein Intensivtraining für ihre Live Speaker Tätigkeit durchlaufen haben, waren die ersten beiden am 17.01.2018 im Museum vor Ort, um das innovative Vermittlungsprogramm JUNGE LIVE SPEAKER zu unterstützen. Nachfolgend können Sie einen Bericht von Isabel Zander-Zeidam lesen. Am Mittwoch, dem 17.01.2018, war ich im Rahmen der Kulturpartnerschaft unserer Schule mit dem Bauhaus-Archiv zusammen mit Max in der Ausstellung ‚New Bauhaus Chicago, Experiment Fotografie / Film’ als Live Speaker eingesetzt. 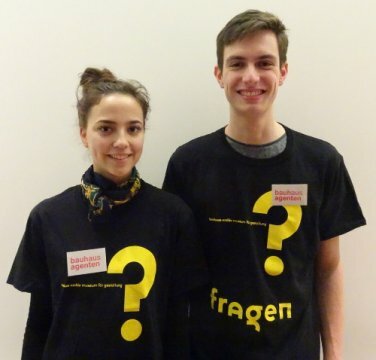 Nachdem wir vor Ort ankamen und uns bei der Museumspädagogin gemeldet haben, bekamen wir unsere “frag mich” T-shirts überreicht und haben uns sogleich in die Ausstellung begeben. Wir haben von der erfahrenen Live Speakerin Ilke Küster ein paar Tipps als Einleitung bekommen und uns in den Ausstellungsräumen verteilt. Uns wurde ein Schreibpad zugeteilt; dann mussten wir uns ein Kunstwerk aussuchen, das wir zur Übung den anderen gegenseitig vorstellen sollten. 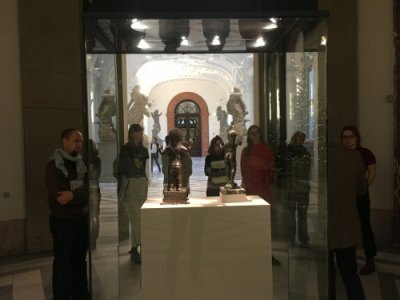 Das hat ganz gut geklappt und wir fühlten uns sicher – darauf hatten wir keine Bedenken mehr, die Besucher einfach anzusprechen und uns mit ihnen über die Kunst zu unterhalten. Am 6. 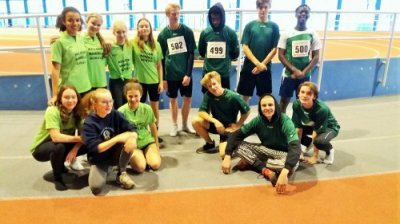 Dezember 2017 fand das 10. traditionelle Leichtathletik-Indoor-Meeting der Oberschulen Berlins und Brandenburgs im Sportforum Berlin statt. Im Wettkampf starteten 10 Mädchen- und 15 Jungenteams der Jahrgänge 1999-2003. Gewetteifert wurde in den Disziplinen 60 m, 200 m, 800 m, Kugelstoßen, Weit-, Hochsprung und der Olympischen Staffel (800 m-200 m-200 m-400 m) zum Abschluss. 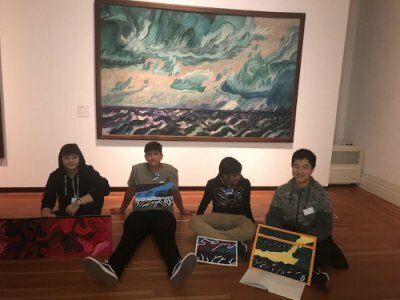 The students of the IB12 Visual Arts class were thrilled when receiving a positiv response from the curator Jonathan Fine who offered to guide the group through his exhibition BEYOND COMPARE @ Bode-Museum on Museum Island. On December 15, 2017, they first spend some time to get an overview of the show and then met Mr. Fine at 11am. By confronting the students with the positions and critical perspectives of art historians he increased their awareness of a bias perception of art from different cultures. In the exhibition, art objects from African cultures are placed in relation to European art from the Renaissance and Baroque. The students learned about the similarities in spiritual interests and sociocultural themes but also about the passages/stories of migration and colonialism that led to a vivid exchange of cultural objects. We are very thankful to Mr. Fine for the unique insight he gave us to his exhibition! 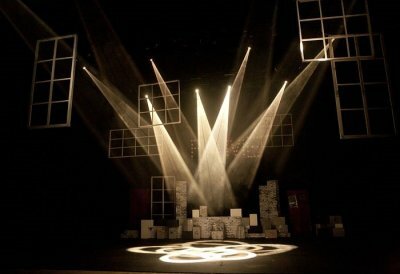 The IB Theatre class performs The Projects on 31 January 2018, 6 p.m., in the P30 Aula. Am Samstag, den 13. Januar fand wieder der Abend der Kunsttalente im Martin-Gropiusbau-Bau statt. Diesmal nahm die Klasse 8e unserer Schule teil, die seit Anfang des Schuljahres beim Schüler*innen-Intensivprogramm des MGB im Rahmen des Kunstunterrichts bei Frau Schulte mitmacht. Zur Ausstellung „Wenzel Hablik – Expressionistische Utopien“ präsentierten unsere Schüler*innen den vielen Besuchern – Familien von über 20 Berliner Schulen – vor expressionistischen Landschaftsbildern von Wenzel Hablik ihre eigenen Werke im Vergleich zu den Arbeiten des Künstlers. Dabei ließen sie sich inbesondere von den rhythmischen Formen und Farbklängen inspirieren. On December 13, 2017, the 17 students of the Year 12 Higher Level Art Class went to their “extended art campus” at Bauhaus Archive to receive a training on how to become a LIVE SPEAKER for the actual exhibition NEW BAUHAUS CHICAGO. 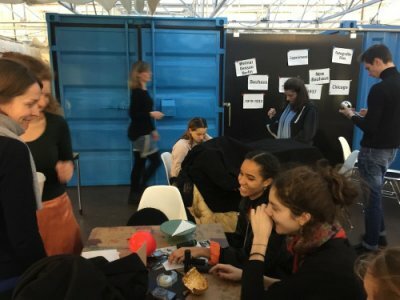 A team of four museum pedagogues along with our Bauhaus agent Friederike Holländer introduced our students to the exhibition at the Bauhaus Archive and with role play practiced their duties as student guides for the museum. After having dealt with photography for the entire semester, the students feel quite confident about the topic and are ready to each take over two to three shifts in their free time as a life speaker for the visitors. At the end of the three-hour workshop the students had the chance to create their own experimental photographs by using the effects of light and shade, reflecting objects and attributes and moving devices. We will keep you updated about the experience of live speaking at Bauhaus Archive.